Transforming your smile doesn’t necessarily require complex treatments like orthodontics, dental implants or porcelain veneers. Sometimes a little brightness can mean all the difference in the world. 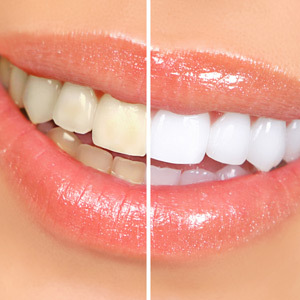 Bleaching (or teeth whitening) is a proven method for dealing with tooth discoloration and staining. Nearly all whitening products, whether home or professional, contain the bleaching agent carbamide peroxide or its breakdown product hydrogen peroxide. These agents effectively diminish staining deep within a tooth (intrinsic) or on the enamel surface (extrinsic), although intrinsic staining will require a more invasive office procedure. If you have extrinsic staining you have three basic options: dental office bleaching, a retail home kit or a kit purchased from a dentist. Again, you’ll find the same basic bleaching agents in each of these versions. The difference will be the concentration: home kits contain about 10% agent by volume, while the office application will be a much higher range of 15% to 35% (which may also employ specialized lights or lasers to increase the bleaching effect). As a result, an office bleaching may take only a visit or two to achieve the desired brightness while a home kit about two or three weeks. Whitening is a more economical route for smile enhancement of otherwise sound teeth than other measures. But there are other considerations you should weigh before undergoing a procedure. Whitening isn’t a permanent fix — the brightness will diminish over time, optimally six months to a year in what dentists call the “fade rate.” You can slow this process by avoiding or limiting foods and habits that cause staining. If you have other dental work — crowns, bridgework or fillings — it may be difficult to achieve a tint level that matches these restorations, especially at home. And while whitening is relatively safe (as long as you’re using your kit as directed), you may experience tooth sensitivity, gum irritation or other minor oral side effects. Before you decide on whitening, visit us first for a complete dental examination. From there we can advise you on whether whitening is a good smile enhancement choice for you.